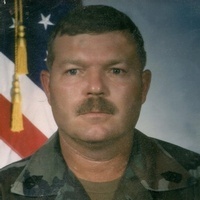 Steven T. Hill, U.S. Army RET, age 69, Webb City, passed away at 4:00 a.m. Monday July 9, 2018 at National Healthcare Center. Steve was born September 6, 1948 in Caney, Kansas to the late Frank and Betty Joann Robison Hill. He served in the United States Army for twenty one years and was awarded the Purple Heart. Steve then worked as a clerk with the United States Postal Service, retiring in 2009. He was a member of the Masonic lodge; Abou Ben Adhem Shrine Temple, Springfield; American Legion of Waynesville; the VFW and Eagles Lodge of Booneville; the American Postal Workers Union; the Forty and Eight Club and Wildwood Baptist Church. Steve was an avid sports fan. He played softball for thirty one years, was an exceptional pool player, played golf, rode motorcycles and watched the Chiefs and Royals any chance he had. His first wife, Debbie Graham, preceded him in death on February 8, 2011. He married Sharon Bray on April 17, 1999 in Joplin. She survives at the home. Additional survivors include children, Nikki Johnson, Kansas City, Missouri, Christy Stirewalt and husband, Mike, Carl Junction, Dustin Jones and wife, Brandy, Little Rock, Arkansas, Cliffton Holcomb and wife, Amy, Webb City; one brother, Michael Hill and wife, Lana, Carl Junction; grandchildren, Steven Hill, Trenton Johnson, Calee Johnson, Billy Ring, Kyle Stirewalt, Ryan Stirewalt, Josh Stirewalt, Kylie Mueller, Lauren Jarvis, Courtney Jones, Faith Holcomb, Fallon Holcomb, Farryn Holcomb, Rocky Holcomb; seventeen great grandchildren and four fur babies, Daisy, Ben, Max and Oscar. Services are planned for Thursday at 10:00 a.m. at Parker Mortuary Chapel. Rev. Joe Morris will officiate. Interment will follow at Ozark Memorial Park Cemetery. The grandsons will serve as pallbearers. Military honors will be provided at the cemetery.